At the heart of any supply chain is the distribution center. Distribution center operations are mission critical in getting products to point of sale locations or increasingly directly to end customers. Operational excellence is an imperative as they must be efficient and cost effective while assuring the high levels of customer satisfaction. Some of the challenges facing the modern distribution center include controlling and managing inventory, handling more demanding and complex customer requests, product diversification and the emergence and increasing emphasis on e-commerce fulfillment. Distribution managers believe close to 3,000 hours are lost each year due to inefficient processes. 60 percent of managers believe that just a few seconds gained in workflow will result in major savings in time and cost. 90 percent of managers believe investing in new technologies would improve worker productivity. Diligent distribution managers are increasingly focusing on order picking as a process to optimize for two key reasons: 1.) it is often the single largest labor /cost center within the distribution center, and 2.) end customer service levels are often directly affected by the accuracy of order pickers. It is also a process for which a technology-based solution has long demonstrated significant value. More than 18 percent of distribution managers feel that the most inefficient segment of their workflow is order picking, and the solution is the implementation of voice. Voice picking refers to the use of a system that uses speech recognition and synthesis technology to “talk” a worker through their pick assignment. While it may sound complex, it’s not. 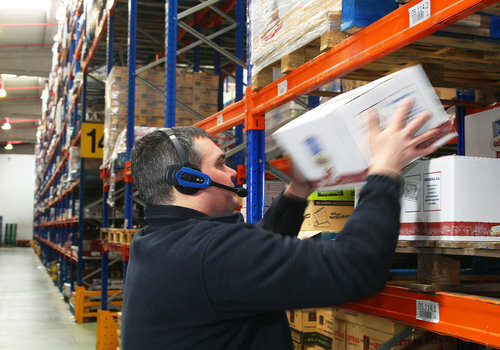 Order pickers wear a wireless headset with boom microphone to receive instructions from whatever host system that knows what needs to be picked. Workers confirm that they are at the correct pick locations by speaking check digits posted there. The system does not allow them to continue until the proper responses are provided. Pick quantities and other information can be verified by the voice system which also ‘talks” workers through exception conditions such as “shorts”. Because the voice-directed worker listens to verbal instructions and responds verbally, they never need to handle, look at or interact with paper pick lists or the handles, screens or keypads of RF scanning devices. As a result they are “hands-free and eyes-free” to make every motion a productive one and keep their eyes and focus on what they are picking. As a result, voice-directed pickers will state: “it allows me to picker faster” and “it’s almost impossible to make a mistake”. As diligent distribution center managers strive to improve the efficiency and effectiveness of their operations, voice-directed picking solutions represent a proven technology based solution with big benefits. More than 500,000 distribution center order pickers use them worldwide each day. Should your order pickers be using voice? Take a step today toward achieving operational excellence by contacting Speech Interface Design today to schedule a complementary consultant and its “Industrial Engineering-strength” Value & ROI analysis. We will project the annual cost savings and ROI a voice-directed picking solution will deliver in your specific operation.